"Look after your daughter's things. And your daughter…"
When a stranger asks Jo Blackmore for a lift she says yes, then swiftly wishes she hadn't. No one believes that Elise is in danger. But Jo knows there's only one way to keep her child safe – RUN. The Escape gripped me from the start and I read the whole book in one sitting, I don't think I even stopped for a quick comfort break. I have read a few C.L. Taylor books and this is definitely my favourite one so far - it is so enthralling, gripping and nerve-racking that my eyes felt as if they were superglued to my kindle. 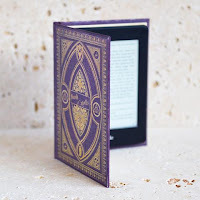 My heart was pounding from the first few pages as the footsteps following Jo were described and I almost jumped out of my skin when they caught up. Ah, it's only a harmless female stranger wanting to ask for a lift. It's definitely unusual and not terribly British but she asks so forcefully and Jo is running late, so she has no alternative but to agree to give her a lift. The stranger identifies herself as Paula and once she is in Jo's car, her behaviour changes and it becomes clear that this isn't a chance encounter. Paula knows who Jo is, she knows her husband and she warns her to look after her daughter. Jo already has a history of panic and fear of leaving the house, so this sends her head into a spin. Naturally, she wants to call the police but her husband, Max, isn't very supportive and he claims that he doesn't know Paula. 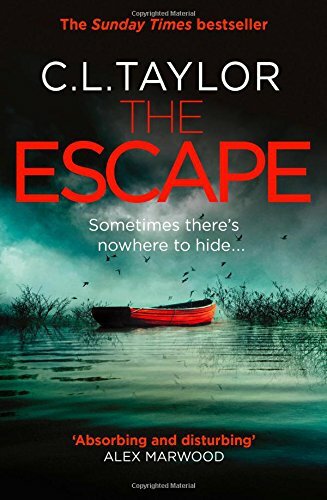 Max works as an investigative journalist and Jo is convinced that, through one of his investigations, he has put her and their daughter, Elise, in danger. When things start happening that Jo can't explain, Paula's threat may be about to come true as Jo's fitness as a mother is called into question. With Max spending all his time at work, Jo does the only thing she can do to keep Elise safe - she goes into hiding. As the search for Jo goes on, she goes to the one place that she thinks nobody will look for her. A place that has been erased from her family history but where the family secrets remain, and we all know that secrets don't stay buried for long. I found myself holding my breath as this fast-paced book drew to a close; the writing is so vivid and I was so immersed in the book that I'm sure I could hear the roar of the sea in my ears. 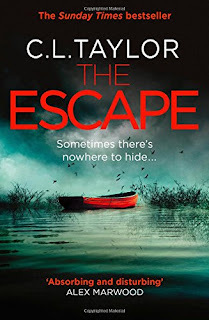 The Escape is superbly written, no wonder C.L. Taylor has such a huge following that keeps her firmly and well-deservedly on the top of the bestseller listings.